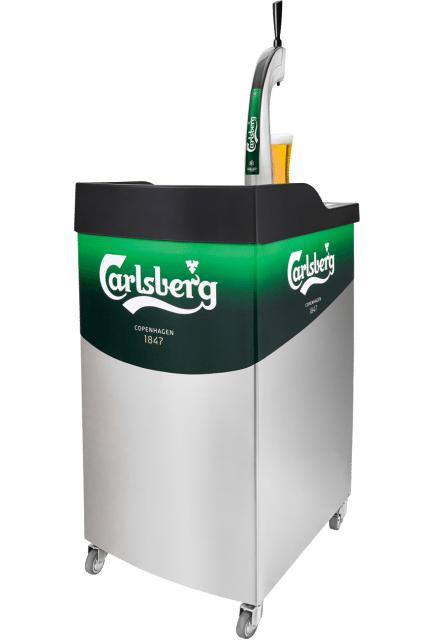 Carlsberg UK has launched a compact draught beer dispenser aimed at smaller on-trade venues, claiming the transportable unit to be a “game-changer” for those serving low to medium volumes of beer. Carlsberg claims its Draughtmaster technology to be a “game-changer” for on-trade outlets serving low to medium volumes of beer. Draughtmaster is a compact draught beer dispenser that uses smaller 20 litre PET kegs instead of steel kegs, suiting those that require less volume. The self-cleaning system requires only water, a power supply, drainage and space for installation, with CO2 replaced with an in-built air compressor. “For us, we’re investing in draught and specifically PET kegs,” said Per Svendsen, vice president on-trade at Carlsberg UK. Carlsberg says that PET kegs offer a long shelf life compared with steel kegs, which have an average shelf life of around one week, while the Draughtmaster will keep beer fresh for 31 days. This is due to the need to pressurise steel kegs with CO2, whereas Draughtmaster uses air only to push the beer out, meaning “nothing touches the beer from when it leaves the brewery until it goes in the glass”. “This means we can ensure the quality of the beer for much longer and an outlet that was restricted in its range in the past, can now serve a great range of draught beer,” added Svensden. Draughtmaster is currently operating in 16 countries in Europe, including Italy, where 90% of Carlsberg products poured in the on-trade use Draughtmaster technology. The Carlsberg UK Draughtmaster portfolio currently includes Poretti 3, Poretti 9, Carlsberg Export, Shed Head, Grimbergen Blonde and Brooklyn Lager, with more of the brewer’s premium brands expected to be added this year. We have a carlsburg draught master flex 20lt since we have had it we have had constant delays in delivery or collection of the barrels from our local Makros. Wholesalers we have been told by the rep that it is your company’s fault I’m not sure what is going on last week we had a large function and no beer to sell. Please could you give me another supplier my area mr Paris Waltham Abbey golf range Waltham abbey Essex.en91bf.